As fellow photographers of stained glass in churches will know, it's easy to get a good picture of a detail. It's possible to find something in the window that you like, even if the overall composition is a bit of a failure. But to me, the design of the whole window and how it works in the building is the crucial thing. These examples below show five of the magnificent windows in St. James' Church, Trowbridge, by two important nineteenth & early twentieth century firms, Powells of Whitefriars and Joseph Bell of Bristol. The church has a comprehensive guide to the stained glass which tells you about the makers and donors as well as the iconography. Duke Chapel, The St. James Window - Powells 1932. Memorial to the four members of the Palmer Family, wool manufacturers, who died on active service. Shows the life and legends of St. James. The details that interest me are less about the story telling and more about the glass painting. I am often drawn to the landscapes behind the figures, such as the garden in the St. James window (above) and the mountains behind St. Stephen (below). However, I think you'll agree that the St. James window is a mess, while the earlier Te Deum window (below) is beautifully balanced. With not too much white glass and delicate colouring, this window sends out a glow from behind the altar. East Window - Powells 1910. Memorial to the churchwarden Burchell Rodway. "Te Deum Laudamus". Looking at the windows from a distance, I found the earlier window by Powells (below) the most satisfying. I love the combination of geometries in the pattern-making, where circles are on diamond backgrounds within vague octagons, leaving rounded sections between for the historical figures. As you can tell, I care more about the shapes between them than the identity of the figures. Baptistry Window - Powells 1896. Memorial to the wool Merchant Alexander Mackay showing historical characters linked to Trowbridge. Wyke Chapel Window - Joseph Bell 1847. Memorial to the wool manufacturer John Clark. "Atonement for the sins of mankind by Christ's death and resurrection". The comparison between those three subtly coloured post Arts & Crafts windows and these two earlier ones by Joseph Bell is startling. They are full of the sorts of detail that I was told (when a student) you are not supposed to do in stained glass - 3d effects, illusionistic space, backgrounds that pop forwards - and they use the most modern vivid colour schemes. The row of angels in the window above is wonderful, the composition ordered but very uplifting. The west window (below) is absolutely amazing, I kept turning to look at it. From the other end of the church the clear, bright colours hold as if there were a light box behind, even on a dull day. West Window - Joseph Bell 1847. "Thanksgiving for a good harvest". Solomon praying for a good harvest; gathering manna in the wilderness; Moses striking the rock with water gushing out; the ravens bringing food to Elijah. I don't know much about angelology and there's so much to learn. I've been visiting and taking photographs of the windows in Cirencester Parish Church; in many of the top lights there are yellow stained glass angels from various periods which are interesting to compare. Trinity Chapel - two of four windows Click on any of these pictures to enlarge. 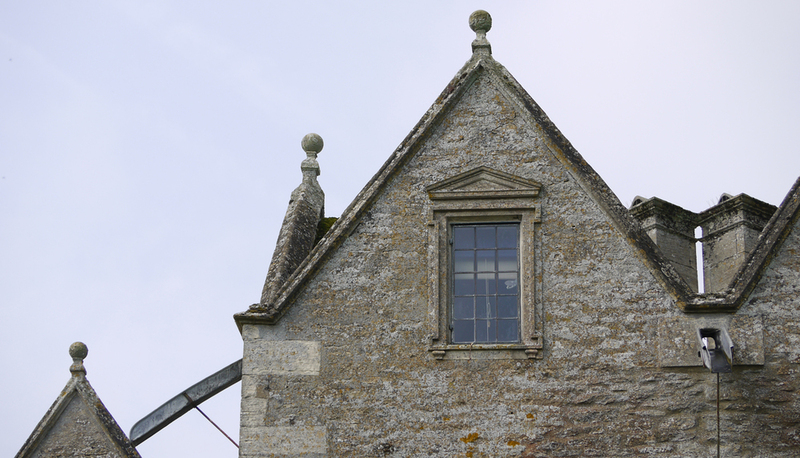 In my opinion, the medieval angels are easily the best and I have read that the glass in Cirencester once rivalled the famous early sixteenth century windows of nearby Fairford. Two different guides told me with great relish that most of the medieval windows here were deliberately broken by the "women of Cirencester" as they tried to get supplies to the soldiers holed up inside the church during the Civil War. The most fantastic angels are the seraphim with peacock feather wings, below right, all the better in my eyes for the breaks and random insertions. They are also the favourite of W.T. Beeby writing for The Transactions of the Bristol and Gloucestershire Archaeological Society in 1916. "Their wings, six in number, cover the greater portion of their body, and are wonderfully feathered, with many eyes as of peacock's feathers, and the yellow stain used in the designs is very clear and brilliant. Mr. James Powell, of Whitefriars, than whom there could have been no better judge, thought the colouring of these seraphim as beautiful as any he had seen. They furnish an excellent instance of the brilliance and vivacity of good fifteenth century glass". The yellow angels theme was continued in the top tracery lights in a number of Hardman windows, two examples are shown above. These angels standing on wheels puts them in the third ranking Order of Angels, two ranks below the seraphim. The guides in the church, the same ones who slandered the women of Cirencester, have all told me that the Hugh Easton window (below) is their favourite. Surely it's not because of these military yellow angels with the boring clear backgrounds, maybe it's the rest of the window which I haven't shown because the point of this piece is to look up at the intricate shapes in the tracery and marvel at the ingenious ways that angels have been fitted in to them.